I ran two games of Symbaroum at Conception (at Hoburne Park holiday resort, a short distance from Christchurch, Dorset) this weekend based on adventures of my own devising. I referenced existing adventures to get me in the right frame of mind in the week before the event, but the adventures proper I ran based on nothing more than an idea in my head. 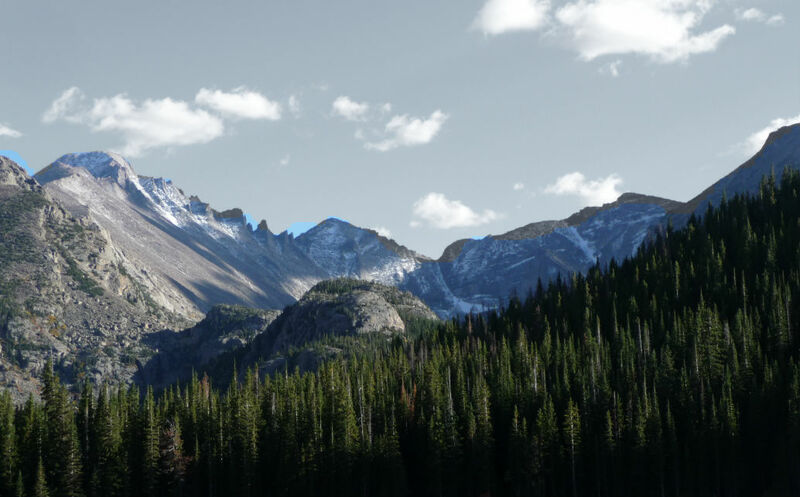 The first, In Titan’s Shadow, saw a group of Queen’s Rangers travelling the foothills of the south, with a particular focus on the refugee camps set up by newcomers crossing the mountains. Camp Titan has become almost a permanent settlement, as one of the first refugee camps to sprout up. It lies at the head of one of the main paths through the mountains from the south. Before reaching the site, they came across three ruffians beating up a refugee in the middle of the mud slick path. They handled the robbers, but discovered the refugee had signs of corruption – and a particular zealous members of the group insisted on ending his suffering. Once they reached the camp, they found the majority of the inhabitants dead – and it would appear the zealot considered burning the camp down a priority over any investigation. The second, Unwell and Unwelcome, saw another group returning to the site a little under 2 years later to investigate the state of the once thriving camp. They found the charred wreckage – now avoided by everyone – protected by the zealot. He had succumbed to the taint of temporary corruption in his original visit here and had served his penance by standing watch and warning off travellers. The group narrowly saved the zealot from death at the hand of three dragouls (undead, commonly found on battlefields), then discovered that corruption had once more crept into the landscape. They tracked the source of the taint and found the means to stop it once and for all – though not without a fight against a very angry guardian. The Theurg (a priest of the Church of Prios) travelling with the party experienced manifestations of corruption on two occasions (with some very unlucky 1D4 rolls) – and decided to sacrifice his life as a means to wash away the impurity of the site. Overall, both games worked out well and the players enjoyed themselves. Most hadn’t heard of the game or perhaps just in passing. The simplified half-A4 character cards provided just enough information – and I had some nice feedback on the quality of presentation. Laminating them proved worthwhile as one player managed to knock over his drink twice! The reference cards with Traits and Abilities also work out well – though the size of the type might have caused a little struggle. I planned each game to have two short conflicts, some exploration/investigation and limited social challenges. Given the four-hour convention slot you can’t go for much more than that – and starting with a conflict helps set the pace for the rest of the adventure (thus the two combat setup). …for those who don’t like player-only dice rolling, nothing could be simpler than running Symbaroum without it – just give the PCs fixed armor values and the enemy a weapons die and you’re (more or less) good to go. Personally, I didn’t have my confidence sorted out for the first session – and I struggled a little when non-player characters acted upon or attacked the player characters. For some reason, that I can’t account for, I struggled with switching the formula around from [Accuracy<--Defence] to [Defence<--Accuracy]. Don’t ask me why! I seemed to have got a handle on it by the second game. Symbaroum’s game system approach uses this mechanic throughout – but I can’t account for getting so muddled about it. It isn’t difficult – perhaps just a little different. How did the rules treat us? Well, I’d say. In truth, simple and straightforward. The spell-casters got used to rolling for temporary corruption. A little guidance sorted out that Toughness was the character’s “hit point” score. Pain Threshold appeared a welcome addition – I think the players liked the idea and it worked both for and against them. The dilemma of knocked prone vs free attack caused some anguish on a couple of occasions, with players genuinely concerned for their survival (or that of their loyal Sow familiar!). I’m not 100% certain about falling damage, which seems quite brutal for some reason. I’ll have to revisit it. We didn’t struggle with any concepts or the need for specific dice throws. Aside from my early issues with twisting around tests for opponents, I never had a problem. My reference sheets meant I only used the core book in-game when referring to the stat blocks for opponents (and the ribbon bookmark came in very handy for that too). I need to make some slight tweaks to my reference sheets. The Melee and Monsters and Corruption reference worked OK. I plan to turn Marks of Corruption into a random chart (it currently has 18 entries – so a couple more with make it a viable D20). I did randomise a couple of times in the second adventure – then adapted the result to the situation. The second time the Theurg experienced a Mark, I ‘rolled’ fangs or nails in the shape of claws or talons – but the presence of a boar in the adventure had me adjusting this to more obvious and flavourful tusks. 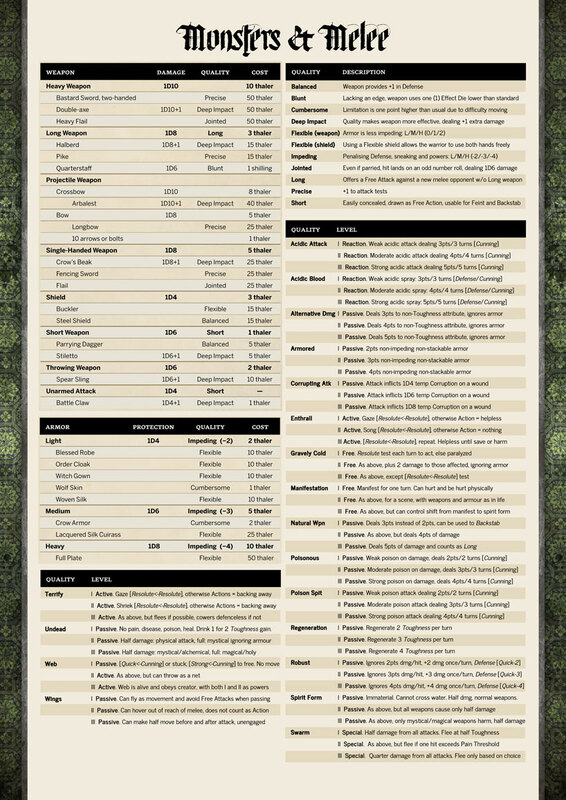 I definitely need to add another section containing a few standard tests and add standard combat tests on the Quick Combat reference sheet. I had a good experience running the game, both as a newcomer GM and with newcomer players (you can see my read through review of the Symbaroum RPG at Geek Native – and my feelings and views haven’t changed having run the game). I will run these adventures again and will look to expand my repertoire of standard set-ups and setpieces. I liked having a second adventure that built on the outcome of the first – and would certainly do that again. I found the game easy to run and explain, outlying the essentials of the situation/setting. I might look to tighten that explanation into a bullet list to make convention preparation and session kick-off even easier. 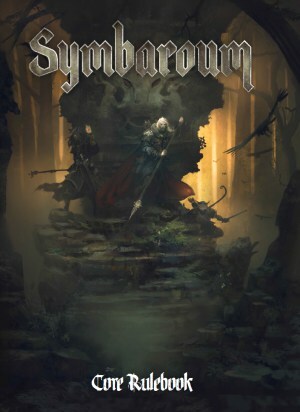 You can pick up the PDF of Symbaroum from RPGNow, or get the physical edition from Järnringen or Modiphius (in Swedish or English). The team has just announced a translation into Spanish.